In the summer of 1915, 21-year-old Edsel Ford and six boyhood friends took to the road to visit the west and the World’s Fair Exposition in San Francisco. Early cross-country road systems like the Lincoln Highway and the National Old Trails Highway were becoming drivable and the U.S. Department of Interior was promoting travel to “See America First.” The year 1915 was the dawn of the American road trip century. Edsel Ford and his friends kept a detailed log of their trip and took hundreds of photographs. The Historic Vehicle Association has worked together with the Antique Automobile Club of America Library (Hershey, PA) to share this unique story with the American public. 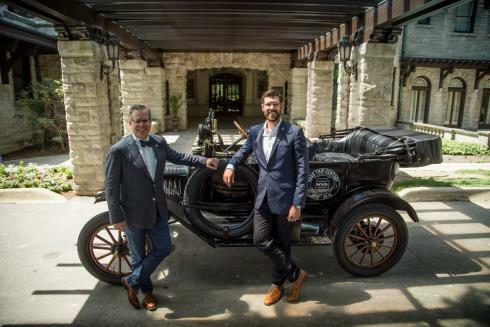 The Historic Vehicle Association is following Edsel Ford’s epic journey, driving a similar 1915 Ford Model T Touring automobile and hopes to continue to cover 150-250 miles per day much like Edsel Ford did 100 years ago.